Water is one of the most fundamental requirements for life. But the most important source of water – our rivers – are facing a grave crisis. In just one generation, India’s perennial rivers are turning seasonal. Many smaller rivers have already vanished. If we do not act now to reverse this, the legacy we hand over to the next generation will be one of conflict and deprivation. 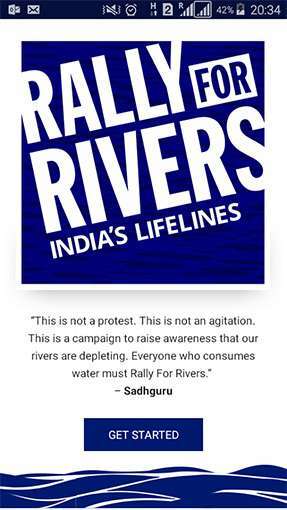 To create awareness and momentum about this national issue amongst all sections of society and government, Sadhguru has conceived the “Rally for Rivers” awareness campaign. Pledge your support to save India’s lifelines. All it takes is a missed call to 80009 80009.